Is your stem not seated properly??? There looks like a significant gap between the fork and stem. This is NOT fully seated on the crown of the fork! To fix this the base bar must come off and the stem needs to be installed properly. Beautiful bike btw - I would recommend you look for the next closest Trek store. just got a 2018 SC. No sc draft box available...out of stock til june. The older 1st generation won't fit my bike. Alternatives for carrying a tubular (no pockets on skinsuit) that would be most aero, efficient not cumbersome? Mount it under your saddle or place it in a water bottle. I’d put it in a water bottle behind the seat. My wife uses one of these on her bike to store tools and spare tube and CO2 behind seat in xlab cage (she doesn’t have draft box capabilities). It’s surprisingly awesome. Has anyone tried this on their speed concept? The first-gen Draft Box can be modified to fit. Not sure exactly how, but one of the local Trek shop mechanics modded his to fit. Interesting maybe they got their shipment early because trek's page says it is in stock, and looks like you would get it in 1-4 days if you shipped from the site to a local shop. Dumb question maybe but does anyone know if both the Bontrager Gen1 and Gen2 seat posts fit on the 2015 Speed Concept? Right now I have the stock aluminum one with 17mm of setback, which isn't enough to meet my fitment..
Any of you had problem with the draft box opening accidentally?This last weekend I was finally able to go outside with my new Speed Concept 2018, but the the box opened itself at least 5 times in less than 200km! I'll put some adhesive tape in there, but I hope Trek does have an answer on that. On my 1st-gen Draft Box, I found a way to fill it so it presses against the closure latch and prevents it from opening. But every single one of the ~50-odd 2nd Gen SCs on my team has tape across the Draft Box 2 to keep it from opening on rough roads. It's, uh, a feature! Have a Gen2 and cannot say I have ever had the problem with it popping open. I know a guy with a gen 1 and I think he taped his, but when I saw inside, he had that thing stuffed, so could have been too much in his box. I know another person with a Gen2 and they have not had theirs pop open either. 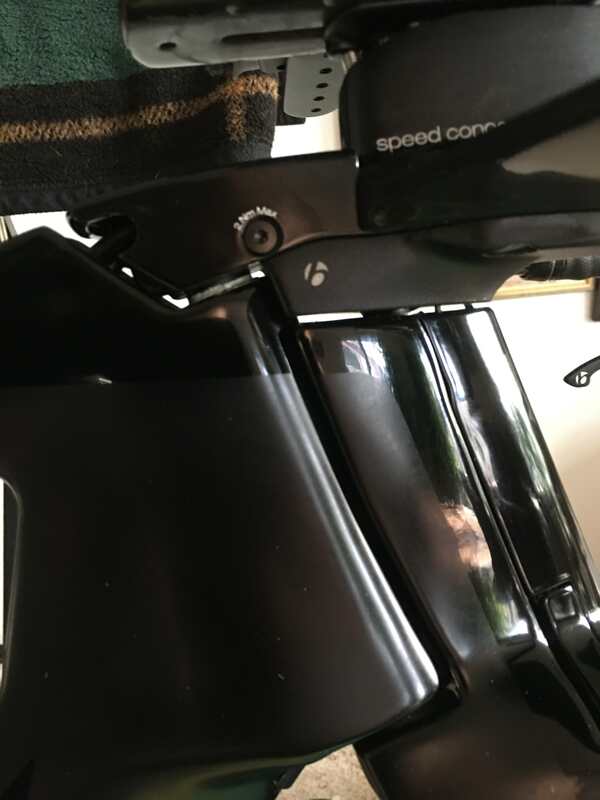 Dumb question maybe but does anyone know if both the Bontrager Gen1 and Gen2 seat posts fit on the 2015 Speed Concept 7.5? Pretty sure it does not fit. I can confirm that the the Gen 1 and Get 2 seat posts are not interchangeable. Thank you! But a Speed Concept 9 seat post with 50mm offset should fit into my Speed Concept 7.5 frame then since both are 'Gen 2' ? I always put a strip of electrical tape across the edge--just a small square or it will open randomly. When I get it closed just right, it will stay fine, but I don't take a chance on it---especially if I have to open it during a race and get it closed in a hurry. You can also gently heat the tab and bend it tighter just a tiny bit and it will work well, but tape is a guarantee. Is you bike mechanical shifting or electronic shifting and how old is the bike? If it's creaking when you pull the rear brake that may be the case, but it sounds like something structural is creaking. Try removing the stem from the fork and checking the headset preload on the steerer bolt if you haven't already.